Certain chemicals are incredibly hazardous if swallowed. Some also pose risks if they contact the skin or eyes. Your puppy is just as at risk as a person when it comes to chemical contact. In order to avoid this potentially deadly situation, make sure all chemicals are securely stored. Whether this means securing a cabinet so it can’t be opened, moving cleaners to a high shelf, or keeping chemicals in a separate room or shed, you want to make sure there is no possible way for a puppy to get into these products. Your puppy is going to want to chew on things. The trick is to make sure they only chew on the things you want, and not the things you don’t. 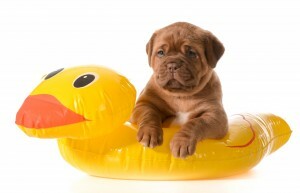 There are many dog toys designed to give your puppy a way to channel their need to chew. Try having a few options available right from the beginning, and then see what kinds attract the most attention from your puppy. This way, you can make sure they are less inclined to chew on other things, like electrical cords. If a puppy does chew cords, it is possible they will suffer an electrical shock, which may be fatal. Your puppy is likely growing fast, and that takes a lot of energy. This drive also means a puppy may try and eat something you wish they hadn’t. Make sure things like cat litter boxes are kept in a place your puppy can[‘t access, or they may try to find a snack there. Certain house plants, like poinsettias, can also wreak havoc if your puppy makes a meal of them. Just because a fence looks secure to us does not mean a puppy can’t wiggle out of it. Walk your fence line and look for any small holes that may need to be repaired. Also, make sure the bottom of the fence cannot be pulled up or easily dug under. Make sure you supervise your puppy outside at all times. If you identify a problem area, try to find a way to make it less enticing or accessible to your puppy. It is, after all, your responsibility to keep your puppy safe.